Inequality in American Communities is an empirical study of inequality in U.S. communities and its impact on individual Americans. The data for this study come from sample surveys in six American cities differing in size and region. In each survey, male heads of households were asked about attributes that ranked them in the system of inequality and about a variety of attitudes and behaviors that might be affected by their ranks. The analyses seek to determine how social rank affects various attitudes and behaviors and compare these effects from community to community. 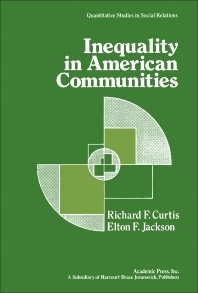 Comprised of 12 chapters, this book begins with an overview of theoretical assumptions about community stratification, with particular reference to how a person's life is shaped by his position in a local structure of inequality. The discussion then turns to patterns of social stratification in six cities: Columbus (Ohio), Linton and Indianapolis (Indiana), and Yuma, Safford, and Phoenix (Arizona). The distributions of various rank variables, such as income and education, in these cities are described, along with the ways in which they are related to form systems of inequality. A basic model of the processes of stratification is also presented. The remaining chapters explore the consequences of social rank and cover topics ranging from social participation and political ideology to anomia and intolerance. This monograph will be of interest to sociologists. Do Americans Perceive a Class Structure in Their Communities? Is a Unidimensional Model Adequate? Differential Association: A Basis for Class Cultures? Mediating Factors: Why Does Rank Affect Political Orientations? Which Social Ranks Affect Anomia? Why Are Men of Low Rank More Anomic? Do Systems of Inequality Differ across Communities?